Numerical algorithm for solving dynamic problems of the theory of viscoelastic medium of Kelvin–Voigt is worked out on the basis of Ivanov’s method of constructing finite difference schemes with prescribed dissipative properties. In one-dimensional problem the results of computations are compared with the exact solution, describing the propagation of plane monochromatic waves. When solving two-dimensional problems, the total approximation method based on the splitting of the system with respect to the spatial variables is applied. The algorithm is tested on solving the problem of traveling surface waves. For illustration of the method, the numerical solution of Lamb’s problem about instantaneous action of concentrated force on the boundary of a half-plane is represented in viscoelastic formulation. This work was supported by the Complex Fundamental Research Program no. 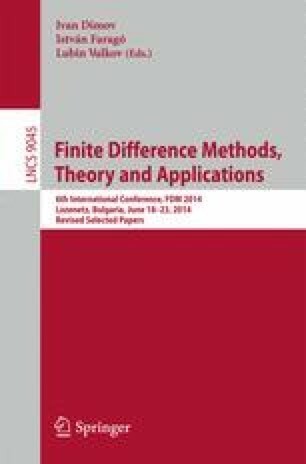 18 “Algorithms and Software for Computational Systems of Superhigh Productivity” of the Presidium of RAS and the Russian Foundation for Basic Research (grant no. 14–01–00130).